mzsunflower | Mzsunflower's Say What? I have a very expressive personality. Possess talent to pursue one of the arts and become successful. I love to mix with people and hate being alone. I love spreading smiles around with my enthusiasm and humor. 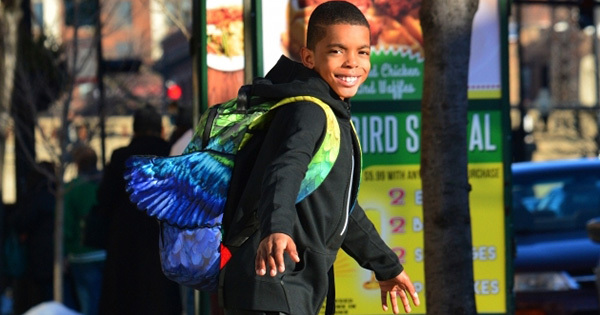 Chicago, IL — Jahkil Jackson, an 11-year old boy from Chicago, has already helped over 20,000 homeless people in his city by giving away ‘Blessing Bags’ through his organization Project I Am. At the young age of 8, he started helping people through small ways and he is up for bigger goals as he grows older.“Seeing people on the street made me really sad because I thought everybody had homes,” Jackson told Today. Jackson was 5-years old when he first saw a homeless person. Since then, he asked his mother if they could buy houses for all homeless people. While it seemed to be a far-fetched idea for a young child, he made efforts to help them through the organization called Project I Am that he established when he was 8-years old. Through the organization, he gave toiletries, food, and water stuffed in what he called ‘Blessing Bags’ to homeless people in Chicago, Los Angeles, Washington, DC, Atlanta, Virginia, and Idaho. His efforts are not limited nationally. He has also helped people internationally, including those orphans in Mbabane, Swaziland, volcano victims in Guatemala, and hurricane survivors in Florida, Houston, and Puerto Rico. “When I’m giving the bags to people it makes me feel like I’m getting one step closer to demolishing the whole homeless thing… and it makes me happy to see the smiles on their faces,” Jackson said. Jackson, who was named a Youth Ambassador for one of the world’s leading anti-poverty organizations Heartland Alliance International in 2016, has also been acknowledged by former President Barack Obama as one of the three most influential people of 2017. “To know that someone like him knows my name, and supports what I do encourages me to keep moving forward every day,” he said in an interview with Forbes. Basketball superstar LeBron James has also recognized him and helped promote Project I Am. Jackson, who loves basketball as a fan and a player, dreams of having his own NBA team one day. Moreover, Jackson continues to help more less-fortunate people in any way he possibly can. Didn’t Have the Best Day?